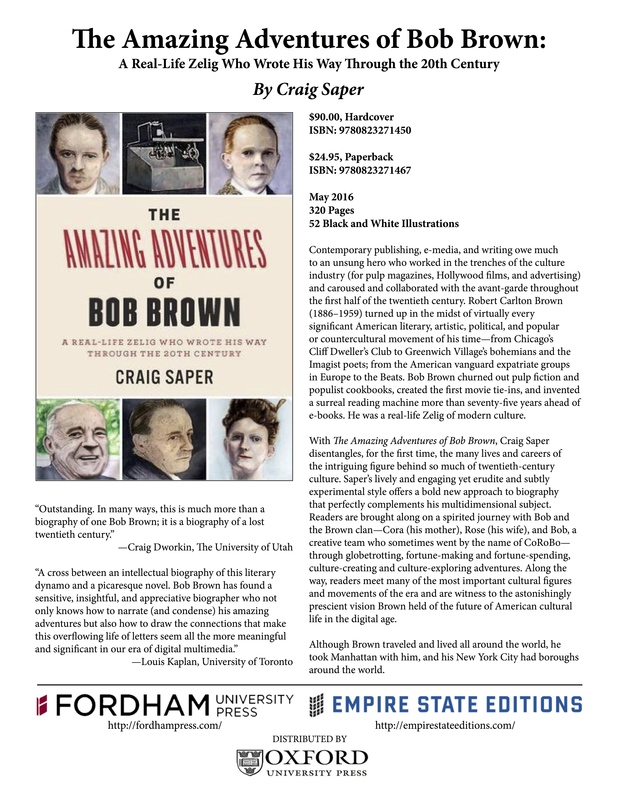 This month, Roving Eye Press celebrates the first biography of Robert Carlton “Bob” Brown, written by Craig Saper and published by Fordham University Press and Empire State Editions. Contemporary publishing, e-media, and writing owe much to an unsung hero who worked in the trenches of the culture industry (for pulp magazines, Hollywood films, and advertising) and caroused and collaborated with the avant-garde throughout the first half of the twentieth century. Robert Carlton Brown (1886–1959) turned up in the midst of virtually every significant American literary, artistic, political, and popular or countercultural movement of his time—from Chicago’s Cliff Dweller’s Club to Greenwich Village’s bohemians and the Imagist poets; from the American vanguard expatriate groups in Europe to the Beats. Bob Brown churned out pulp fiction and populist cookbooks, created the first movie tie-ins, and invented a surreal reading machine more than seventy-five years ahead of e-books. He was a real-life Zelig of modern culture. Bob Brown, a mostly forgotten figure of the first half of the twentieth century, was nonetheless an original, one of the most colorful and versatile individuals of his time. 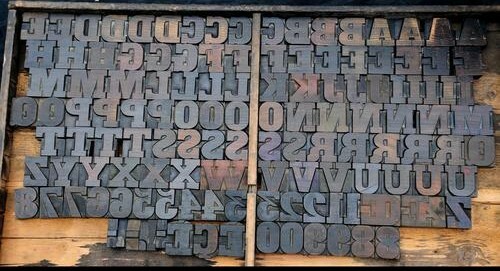 Publisher, inventor, poet, cookbook writer, pulp fiction writer, self-proclaimed ‘fiction machine,’ revolutionary, world traveler, Greenwich Village bohemian, European expatriate –- you name it and Brown lunged at it with both hands. Though today largely a footnote to other people’s stories, Brown has finally gotten a book of his own, a meticulously researched work that traces the rollicking life and times of a larger-than-life individual while also offering a whirlwind tour through every important cultural and political movement of his era. Outstanding. 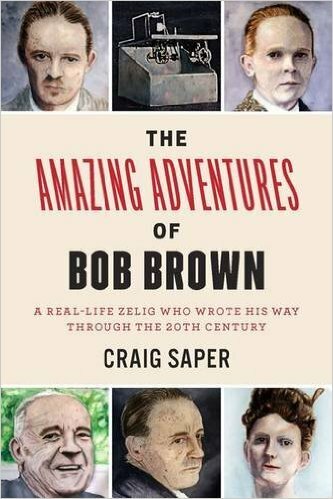 In many ways, this is much more than a biography of one Bob Brown; it is a biography of a lost twentieth century. A cross between an intellectual biography of this literary dynamo and a picaresque novel. Bob Brown has found a sensitive, insightful, and appreciative biographer who not only knows how to narrate (and condense) his amazing adventures but also how to draw the connections that make this overflowing life of letters seem all the more meaningful and significant in our era of digital multimedia. Because Brown’s work presages today’s electronic reading practices, it is easy to see him as a mere visionary. But this underestimates the strong challenge Brown made to the very idea of literary sense-making, which the three books in this relaunch shake to the core with a deep questioning of the act of reading itself . . . To focus on Brown’s relationship to either the more famous Modernists like Stein, or to the modern technologies he presaged, deflects from the thorny questions he asked circa 1930, which have been taken up by subsequent avant-gardists. For the challenges he posed to the way we read–challenges we continue to wrestle with today–Bob Brown deserves his own time in the spotlight. You can click here to view the entire review: Wingate Review _ American Book Review. Wingate, Steven. “The Way You See The Text.” American Book Review 37.2 (2016): 22. 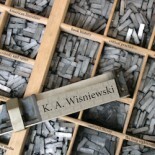 This entry was posted on May 16, 2016 by k.a.wisniewski in News, Poetry, Printing History, Reviews, Roving Eye Press, Writing/Publishing and tagged Bob Brown, experimental literature, Printing History, Publishing, Roving Eye Press, Small Press.